There’s fun galore in store for the boy who has this realistic sounding Thompson machine gun. 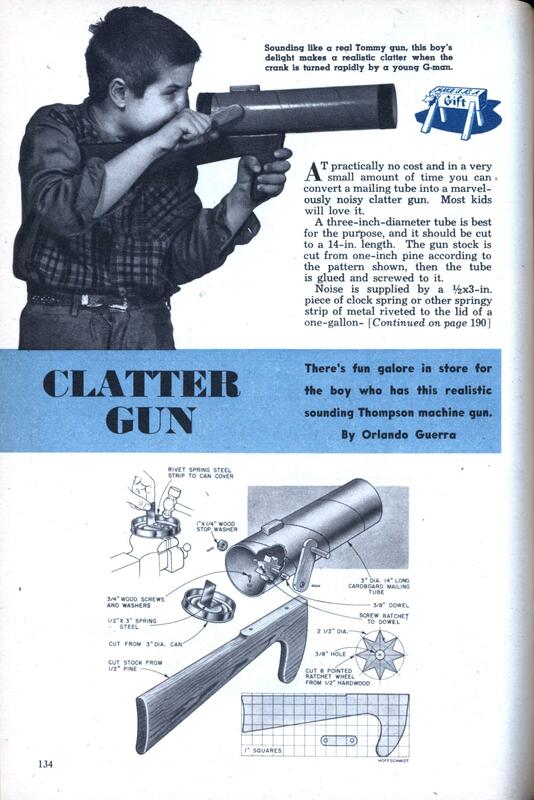 By Orlando Guerra AT practically no cost and in a very small amount of time you can convert a mailing tube into a marvelously noisy clatter gun. Most kids will love it. A three-inch-diameter tube is best for the purpose, and it should be cut to a 14-in. length. The gun stock is cut from one-inch pine according to the pattern shown, then the tube is glued and screwed to it. Noise is supplied by a 1/2-3-in. piece of clock spring or other springy strip of metal riveted to the lid of a one-gallon- size can of developer which happens to be precisely the right size for the 3-in.-dia. tube. (The bottom of an ordinary tin can may be used if it is cut to leave a half inch of the sides attached to it. But make sure that it also has a 3-in. dia.) A ratchet is cut according to the drawing from any 1/2-in. hardwood. It operates by plucking at the spring when turned by the handle, thus giving the staccato, machine-gun effect. The ratchet turns on a piece of 3/8-in. dowel (obtained from an old wooden coat hanger) attached to the handle. Three-eighths-inch holes are drilled on each side of the tube and in the center of the ratchet. Insert the dowel in one of the barrel holes, through the ratchet (making sure that it is centered), then out through the second hole in the barrel. Then screw the ratchet securely to the dowel, and attach the handle and end piece. Secure the noise maker to the end of the tube, but be sure that the spring is in between the teeth so as to allow the ratchet to pluck at it. Shellac and finish by painting the clatter gun in bright, contrasting colors. For an added touch of realism, cover the front end of the gun tube with fly screening or any other fine mesh wire. Then attach a medium-size cork to it—just above the center. This will simulate a real Tommy gun’s small barrel opening. Could you post page 190 as well? It’s there in the OCR, but there’s no scan. Apologies – the thumbnail just didn’t load. It’s fine. 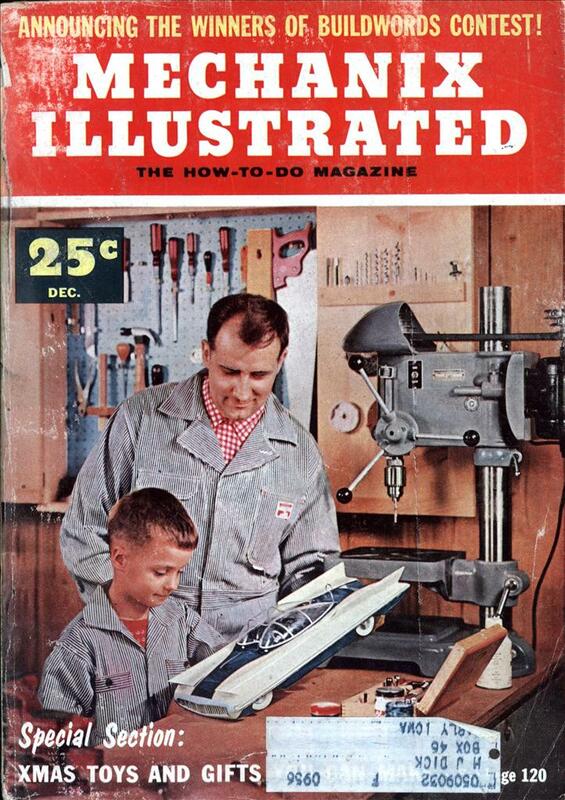 “Most kids will love it.” Great – there’s no way you’d see that sort of advertising today.